Madison Genesis' Matt Cronshaw sprinted to a narrow victory in the Leicester Castle Classic, final round of the British Cycling Elite Road Series on Sunday. The 26-year-old from York edged to victory ahead of six breakaway rivals at the end of the 80-kilometre Kermesse-style race which took in 20 laps of a circuit around the city’s castle and football stadium. Pedal Heaven’s Alex Paton took second and George Atkins (One Pro Cycling) was third, but the day belonged to Madison Genesis. The whole team worked hard throughout and had riders in all the decisive breaks, culminating in victory for Cronshaw, who placed second in the Colne Grand Prix last month, a round of the Elite Circuit Series. In the final overall standings, Steve Lampier (Raleigh GAC) won the Elite Road Series, but he was pipped on countback for the Grand Prix Series by team-mate Evan Oliphant. The team classification was won by One Pro Cycling, while Eddie Dunbar (NFTO) was the top Under-23 rider. Earlier in the race, Chris Opie (One Pro Cycling) and Tobyn Horton (Madison Genesis) were among the first to make a bid for freedom as they attacked off the from towards the end of lap one, and although they were pulled back they didn’t go too far back. The bunch split in two with the high pace, and some riders were already dropping out of the back. Shortly after a group of 12 gained around nine seconds off the front – and this again included Horton and Opie. But Horton was joined by three of his Madison Genesis team-mates, and they pushed the pace on which resulted in the 12 becoming 11 and quickly gaining up to 30 seconds on the bunch. Mark McNally, Matt Cronshaw and Mike Northey were now up front with Horton, while Raleigh-GAC had two riders in Ian Wilkinson and Evan Oliphant, while Pedal Heaven also had two riders in the lead group in Alex Paton and Rory Townsend. Gabriel Cullaigh (100 Per Cent ME), JLT Condor’s Graham Briggs and Opie were the others in the front group. At one point the leading 11 was in danger of splitting in two, with Madison Genesis pushing hard at the front, but despite five going about three seconds clear of the rest of the break, the 11 just about managed to stay together. But with the race an hour old, the gap started to come down as the bunch refused to allow the escapees much more daylight and their lead soon dropped to 17 seconds. The bunch was soon within touching distance of the leaders, and despite McNally, Wilkinson and Paton trying to attack again and stay clear they too were soon swallowed up by a rapid peloton. With seven laps remaining another attack proved successful, and Madison Genesis were in their again with Erick Rowsell and Matt Cronshaw, while One Pro Cycling’s Jon Mould and Andrew Hawdon (Raleigh GAC) also in there. The gap grew to 18 seconds in the space of a couple of kilometres, but with 25 kilometres left it was still far from certain if they would stay clear. The chase was on, as Paton, McNally and George Atkins (One Pro Cycling) launched themselves off the front in a bid to make the leading four a group of seven. They made contact shortly afterwards, and the gap back to the bunch grew further. But not content for a seven-up sprint finish, Erick Rowsell attacked. The Madison Genesis rider, who won the Tour of the Reservoir back in April, quickly gained eight seconds on the remains of the leading group, while the bunch was now nearly a minute off the pace. But he was pulled back with three laps left, while the bunch had dropped back to around a minute and a half. With two laps left Mark McNally (Madison Genesis) attacked, and he held a lead of around five seconds until mid-way round the last circuit when he was swallowed up. Heading for a seven-rider sprint finish, it was Cronshaw who took the win, edging ahead in a photo finish from Paton and Atkins. “It was an incredible race,” said Cronshaw. “The first group that went away had four Madison Genesis guys in it. Most of the team have just come back from a training camp in the Pyrenees so we thought they may be a bit tired, but that wasn’t the case which was amazing. “Erick [Rowsell] was like ten men today. 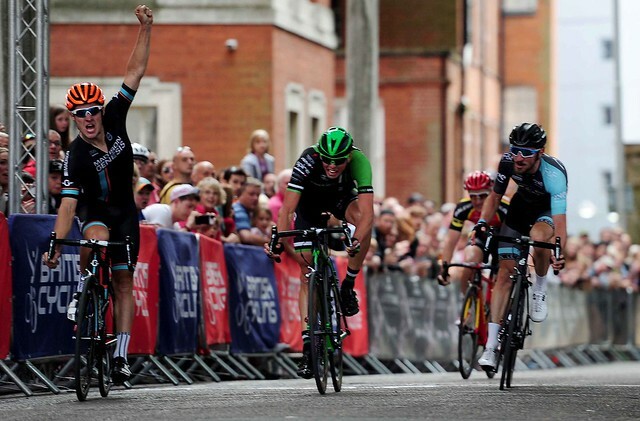 If he wasn’t driving it he was attacking, and he and Mark [McNally] set things up brilliantly for me in the sprint. “Erick had a few digs, but with a lap and a bit to go McNally attacked and stayed away. Jon Mould brought him back and it all went pear-shaped, but in the sprint I came round Alex Paton with a few metres to go.